Ethereal and angelic describes this unique maxi dress with a hint of sparkle at the bust. The Shimmering Lights Embellished Lace Maxi Dress is fully lined to the mid-thigh. The top part is made of lace with miniature clear sequins throughout, giving it a hint of shine. Lace trim crisscrosses in the front, adding another dimension. The attached skirt is made of chiffon and has an asymetrical hemline that is slightly shorter on the sides. An open back design and hidden back zipper complete this dress. 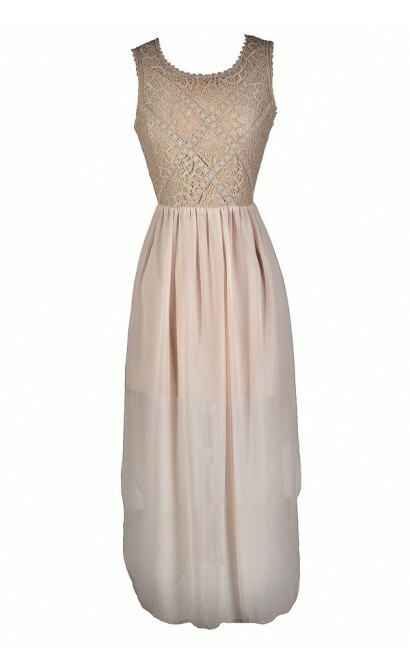 The Shimmering Lights Embellished Lace Maxi Dress would look nice paired with pumps or strappy heels and a clutch. Details: Lined to mid-thigh. Hidden back zipper. 100% polyester. Contrast: 75% nylon, 10% spandex, 15% polyester. Lining: 100% polyester. Trim: 100% cotton. Dry clean only. Small measurements: Length from top of shoulder to hemline: 50". Bust: 34". You have added Shimmering Lights Embellished Lace Maxi Dress in Beige into Wishlist. You have added Shimmering Lights Embellished Lace Maxi Dress in Beige for Stock Notification. You have set Shimmering Lights Embellished Lace Maxi Dress in Beige as a loved product. 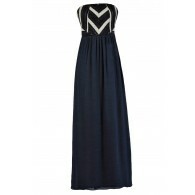 You have removed Shimmering Lights Embellished Lace Maxi Dress in Beige as a loved product.